The consumers who covet the latest models of their smartphones, tablets, and laptops are the very same ones who refuse to acknowledge the glaringly obvious problem that comes after their device reaches the end of their life; where does the waste go? E-waste is not a new thing. In the early 2000’s, socio-political groups and economists were already predicting where the gadget craze would leave us. Some companies and organizations attempted to deal with the threat before it could escalate, introducing buyback and trade-in programs that would discourage users from throwing their tech away. By the 2010’s, awareness about electronic waste electronics became widespread. People knew that their phones didn’t just magically disappear once they went down the garbage chute, much in the same way they knew their old laptops would remain at the bottom of their drawers. However, knowing a concept and doing something about it are two vastly different things, and many consumers found recycling e-waste to be more trouble than it was worth. To be completely fair, they can’t be blamed. No nationwide or global systemized process for recycling e-waste exists. The incentives offered are rarely worth the effort. It’s easier to tuck non-functioning gadgets away and forget about them. Most consumers lack the facts and figures that make the situation real; something more than just a concept where only the government departments directly responsible for it are concerned. 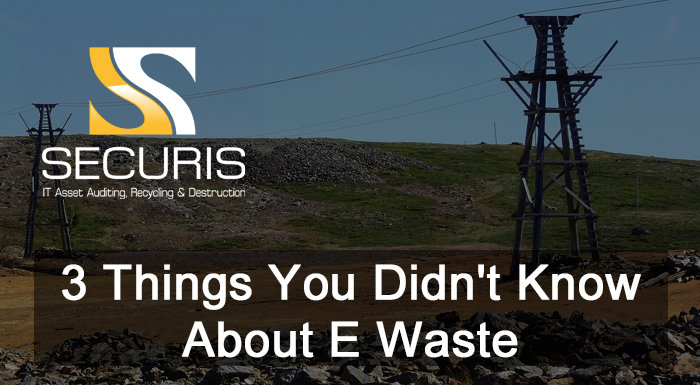 With that said, here are three crucial facts about e-waste that you should know. Gadgets are made up of a wide array of metals and materials; gold, chromium, copper, lead, etcetera. The widespread demand for these metals means that they will eventually run out, and there’s only so much we can mine before the well runs dry. Unfortunately, the electronics industry is considered one of the largest copper consumers, second only to building and construction. In fact, an EPA report revealed that one metric ton of circuit boards can contain 30 to 40 times the amount of copper mined from one metric ton of ore. The problem is that only 30% of the world’s demand for copper is met through recycling copper scrap. That means that 70% of it is supplied through the active mining of a steadily depleting resource. Even if recycling manages to fulfill 40% or 50% of global consumption in the next couple of years, it may still be a case of too little, too late; a United States Geological Survey (USGS) revealed that at least 210 kilograms of mine waste arise for every 1 kilogram of copper mined. Residential consumers are not the only active e-waste contributors. Manufacturing electronics alone produces substantially more waste than most households collectively. Back in 2014, 3.1 million metric tons of e-waste was collected from all households in the European Union alone. In the same year, 16.2 million metric tons of waste came from electronics manufacturing. The waste from manufacturing includes materials such as scrap metal, copper wires, leftover glass and plastics, and large volumes of potentially hazardous chemicals. The most amount of CO2 released from laptops, desktops, phones, and tablets is during the manufacturing process. Hence, individual consumers are not the only culprits behind e-waste. Electronics manufacturers must also realize their own active contribution, otherwise change won’t be incited. You’re probably already familiar with what burning materials such as lead, copper, chromium, and mercury can lead to; large plumes of highly toxic gases that could later be inhaled by thousands. Lead poisoning, respiratory issues, and mental health repercussions are just some examples of what can happen to people exposed to such aerial pollutants. Ergo, burning tech and gadgets have severe consequences in the long run. E-waste is a genuine concern that touches all of us, regardless of our personal contribution. At this point, it’s not enough to passively stand by. Taking an active stance on the matter and doing our personal best to minimize our e-waste is perhaps the only definitive solution in the foreseeable future. If you would like more information about safely disposing of your e-waste, please contact us today. Our team of experts will ensure your electronics are disposed of using industry best practices and processes.